It is safe to say that at 80 years old, Karl Lagerfeld still puts on a good show. With his striking and unforgettable grayish-white hair, black sunglasses, and starched high-neck collar, many might recognize him whether they’re a fashion lover or not. Aside from his indelible look, he has proven season after season for about 30 years of leading the world-renowned fashion house Chanel that he can basically do no wrong. While some fashion critics may not always agree with his whimsy or zealous take on fashion to keep up with the “Joneses”, he still manages to wow us every time. 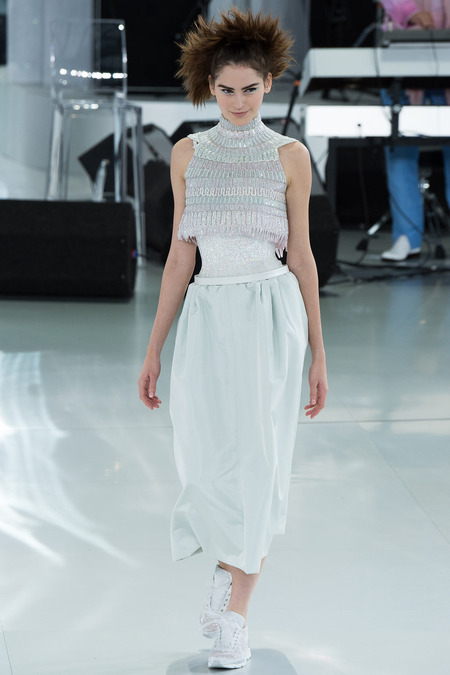 In his Chanel Couture Spring 2014 Show, Lagerfeld brings a vivacious and energetic appeal to the collection by displaying his youthful yet timeless stance on fashion. This past Monday, January 20, 2014, A-list stars, models, celebrities and fashion critics waited as the ultramodern show suddenly began. With an orchestra of jazzy tunes in the background, models skipped and leapt down the white shiny staircase in their couture ensembles and unexpected sneakers. There was an assortment of whites and pastel hues – baby blues, peach, and soft pinks and purples, while the later part of the collection showed darker hues – including grays, blacks, and greens. Lagerfeld opted for the classic Coco Chanel tweed fabrics as he often does, but by varying the volume of the shoulders, bodice, and hips, the dresses appeared more structured and a bit futuristic. It appeared that Lagerfeld wanted a chic and sporty appeal to the collection; while every model wore sneakers, some also wore kneepads, elbow pads, and fanny packs to top off the look. Versatile and beautiful dresses and pantsuits dominated the runway, but it was the details and embellishments that intensified the collection. Embroidery, transparency, sheer fabrics, beads, corsets, and bolero jackets gave way to youthful femininity, while the luminous flowing dresses at the end showed the modernity and maturity of couture. But it was the youthful and vibrant side of Karl Lagerfeld that shined through even more. Beyond a fashion mogul, Karl Lagerfeld also touches other areas with his style – whether through directing a short movie for the latest Chanel perfume or photographing the latest star. Nevertheless, his fashion presence is always the centerpiece: he displays amazing haute couture fashions which only he can convey, and always manages to stay versatile, fresh, and commanding in the process. 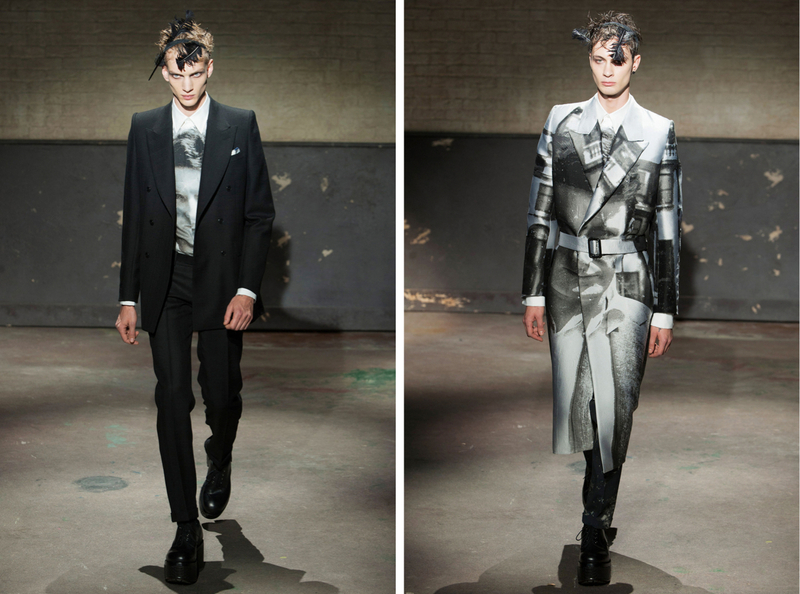 Alexander McQueen Fall 2014 Menswear Collection shows the dark side of fashion, and is quaintly reminiscent of the late designers past collections.